Had fun over Christmas touring on the 1290 . Did over 4000 km in 6 days found the bike a awesome tourer but not great in wet weather . Pissed down for two days in Queensland . Pffff didn't even popped in to say hello! Nice trip! Good motoring 6 days and 4000 km. 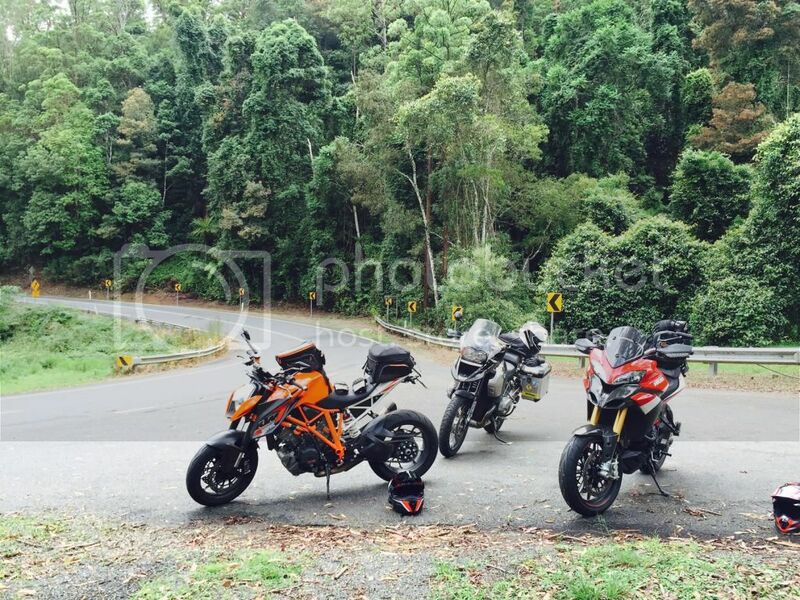 wilks wrote: Had fun over Christmas touring on the 1290 . Did over 4000 km in 6 days found the bike a awesome tourer but not great in wet weather . Pissed down for two days in Queensland . What bothered you in wet ? That fact I was wet . Looks like an awesome setup. Get the small windscreen you wont regret it for long travels. Great pics mate. Little bit greener over that side of the country. Done 3 days 1000km last week and found the bike to be pretty comfortable on the body. Probably the worst part was the seat pressing in on my inner thigh but not that bad. Not quite a 1000km a day bike but 600km would be easy enough. I had like you wilks 4000km in 6 riding days. I can't wait for my next trip to the alps in may/june! What are your thoughts on the powerparts tail bag? I'm in the market for a tail bag but haven't decided which to get yet. Does it fit lots of goodies? It's quite big and can expand if you need more room . Fits perfect you would not know it's there . wilks wrote: It's quite big and can expand if you need more room . Fits perfect you would not know it's there . I think I'm going to get the powerparts large tail bag you have pictured.... I'm 6'4" and am wondering if this bag may double as a back rest. Does it work as a back rest at all if you want to slide back into it? I never really used it to lean against it . 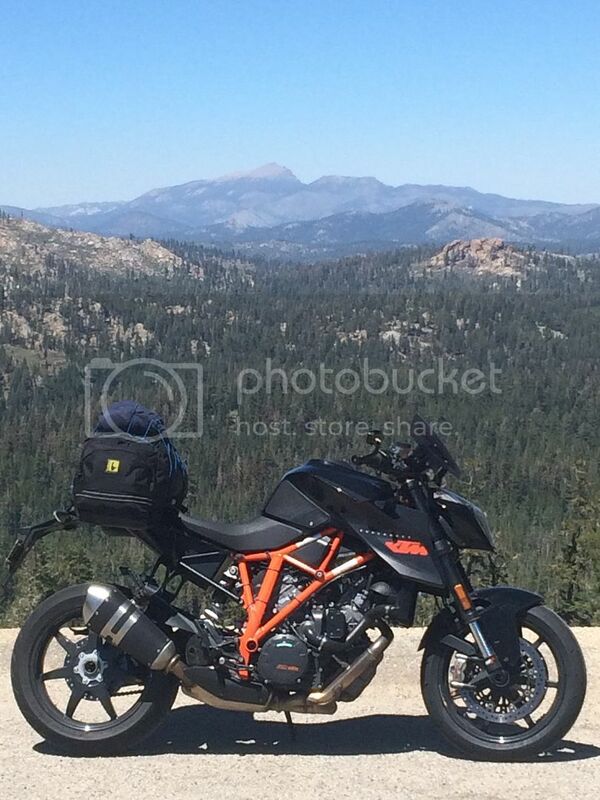 I just let a mate use it for his trip on his 1290 he really liked it as well. . I am going for a trip tomorrow and I have the powerparts large rear bag. But I am not able to fit the rain cover that was included. Is it suposed to be on the inside or cover the whole bag from the outside ? There is no way that I can fit it on the outside .. Any tip would be nice! edit; Found out that the raincover is ment to be on the inside of the bag! Last edited by Olden on Sat Apr 25, 2015 5:30 pm, edited 1 time in total. wilks wrote: That fact I was wet . While my SD is being fixed I'd thought I'd show my touring set-up. 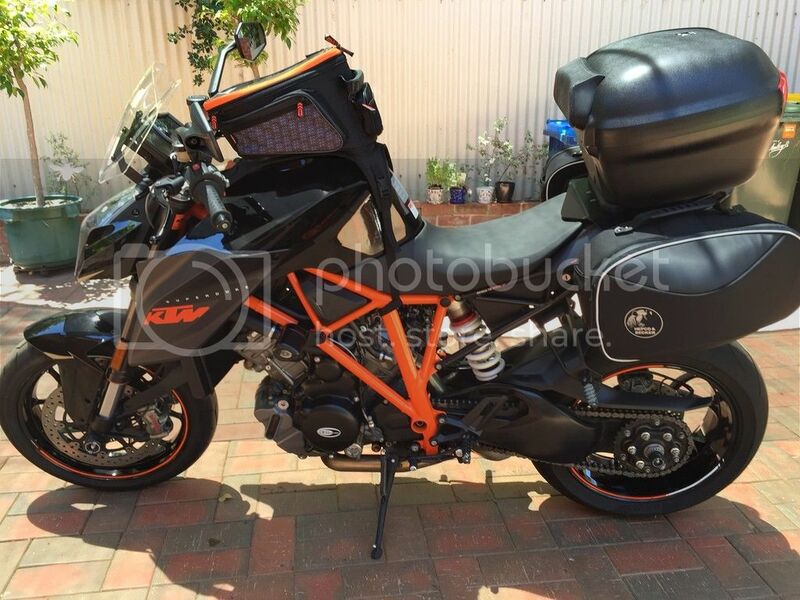 We did 3000km last Feb in the Vic high country & this set up worked really well. 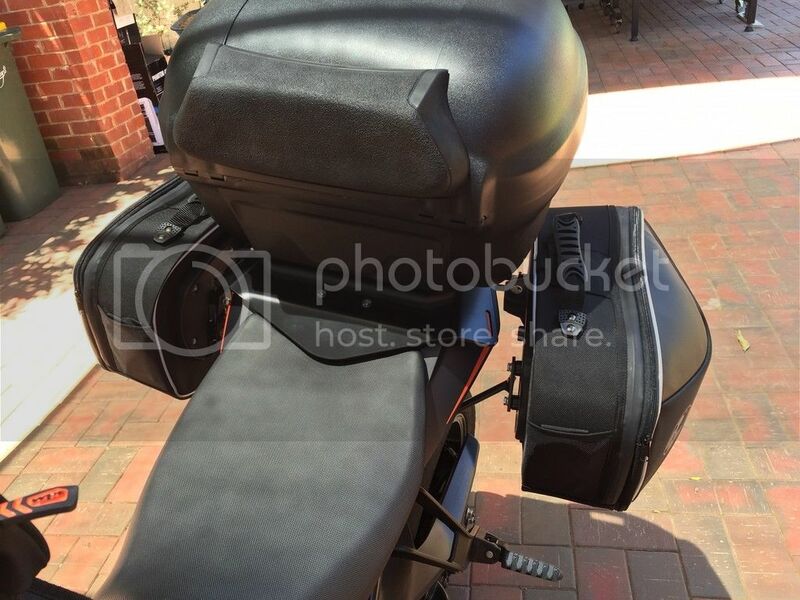 I wanted a lockable top box so I didn't have to worry about leaving cameras etc in a soft tail bag. Dang, this thing makes a great tourer. Did a quick 2 & 1/2 day, 1000 mile shred with full camping gear. Southern Sierra, north of Kernville. What tail pack is that? sunofnun wrote: What tail pack is that? You are almost correct, sir. It's the Beta Plus. Fits the bike well, holds a lot, and you can't tell it's there when riding. My first post... just bought a 1290r and she arrives in a week. I like your topbox setup with the Hepco Becker Sportsrack. Which topbox is that? The Journey TC40 ? I'm after the Journey TC52 or the Junior TC55. 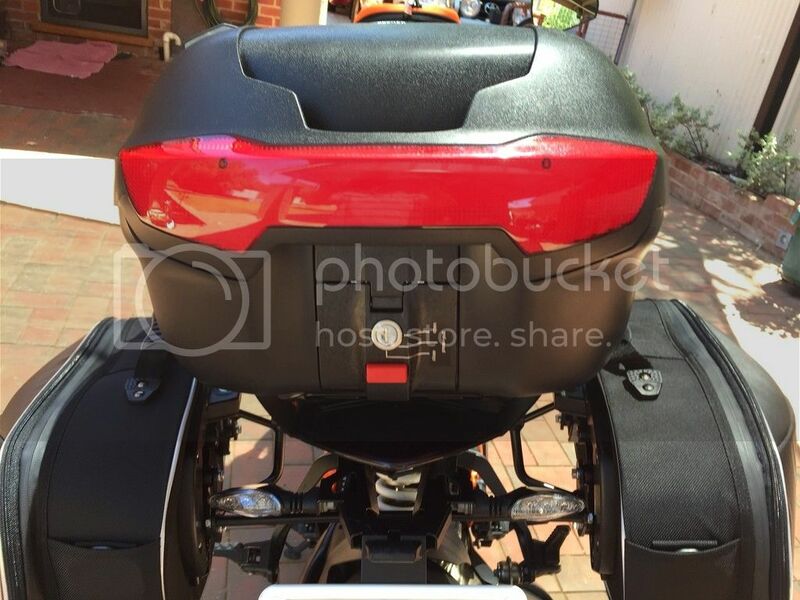 However Hepco Becker in Oz wont reply to my questions about fitment to the sportsrack. So maybe you can help? Do we need to by an extra fitting of some kind to add to the top of the sportrack so that a topbox can attach to it? 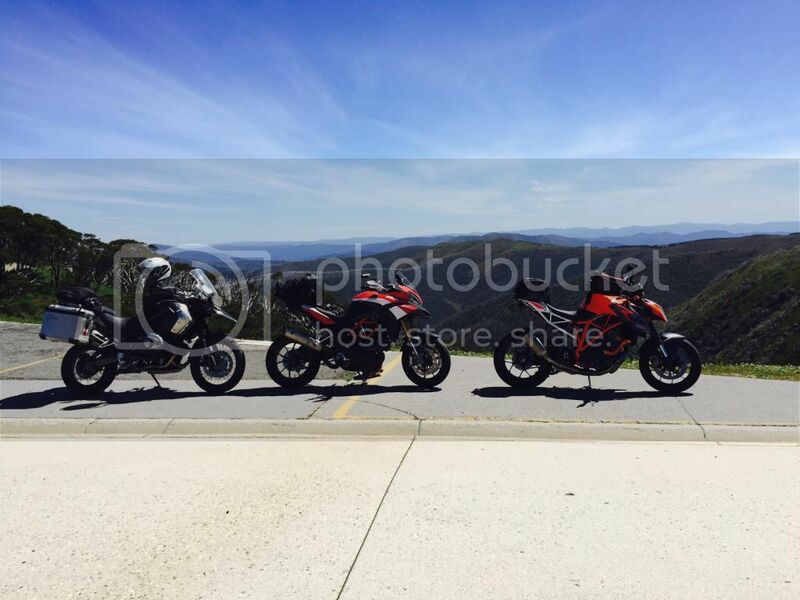 If so, which ones do we buy that fit the sportsrack for the 1290? Do you have any photos of the sportsrack without the topbox on so I could see the fitting? You can get a Givi Monokey mount kit and add it to the H & B sportrack. I got one from Altrider. The parts are well made and I had no trouble drilling the sportrack to be able to add it. I like the solution. Only caution is that the template that came with the mount kit from Altrider is not correct. I measured my Givi topcase and another Givi rack I have to get accurate dimensions for the mounting hardware. ps: I also flattened the rear lip of the sportrack. My V46 topcase would be too far forward otherwise. I use an Oxford Tail Pack and have done for many miles on a few different bikes - never let me down or come off! Holds enough kit for a week away and has a groove shoulder strap to carry about. I tend to keep the waterproof cover on it at all times. 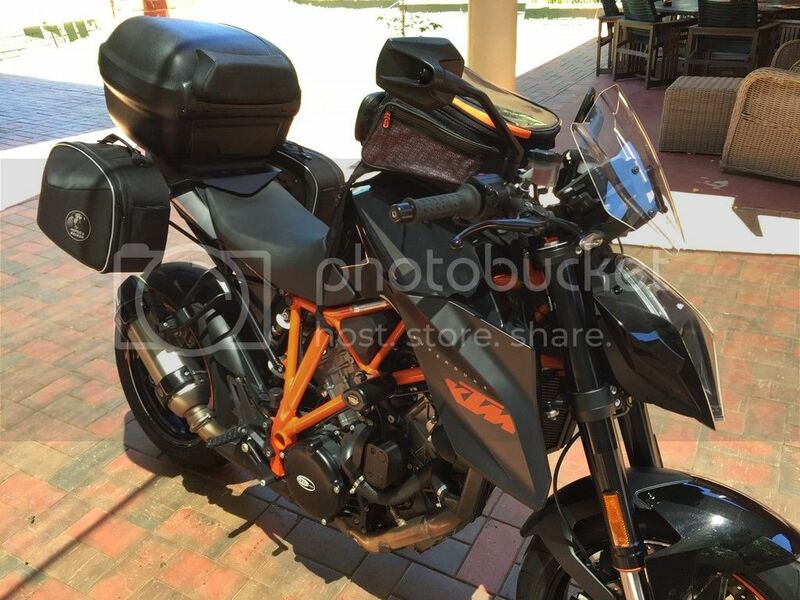 As for the KTM tank bag, I don't have room for it with my Sat Nav, so it sits in the garage unused..
Firstly, congratulations on the 1290! It is an amazing machine that will blow your mind. I'm on holidays in NZ at the moment so I can't go & look at my touring gear but from memory it is the Journey 40. 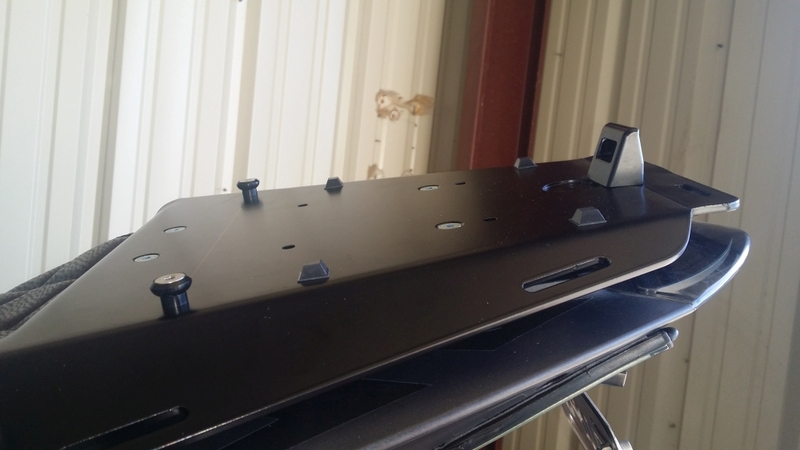 It comes with a mounting plate that bolts directly to the sports rack. 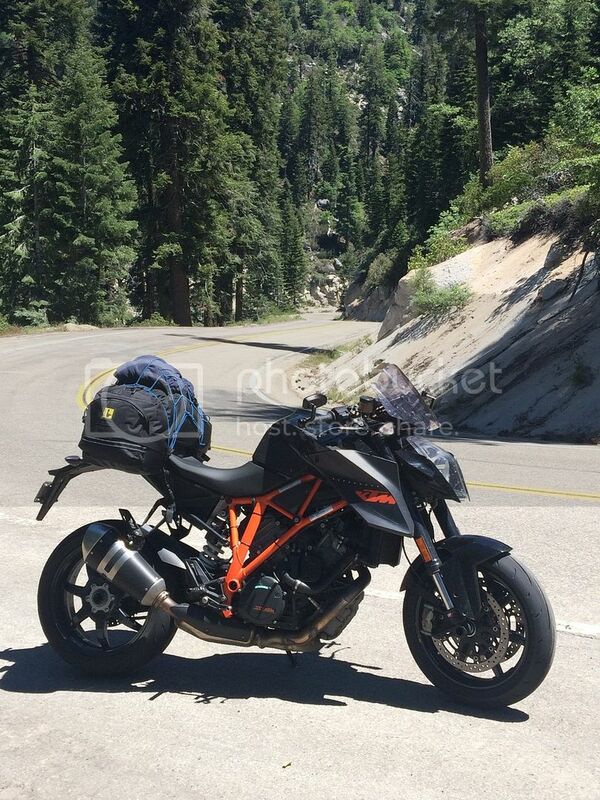 ma1290rky wrote: I use an Oxford Tail Pack and have done for many miles on a few different bikes - never let me down or come off! Holds enough kit for a week away and has a groove shoulder strap to carry about. 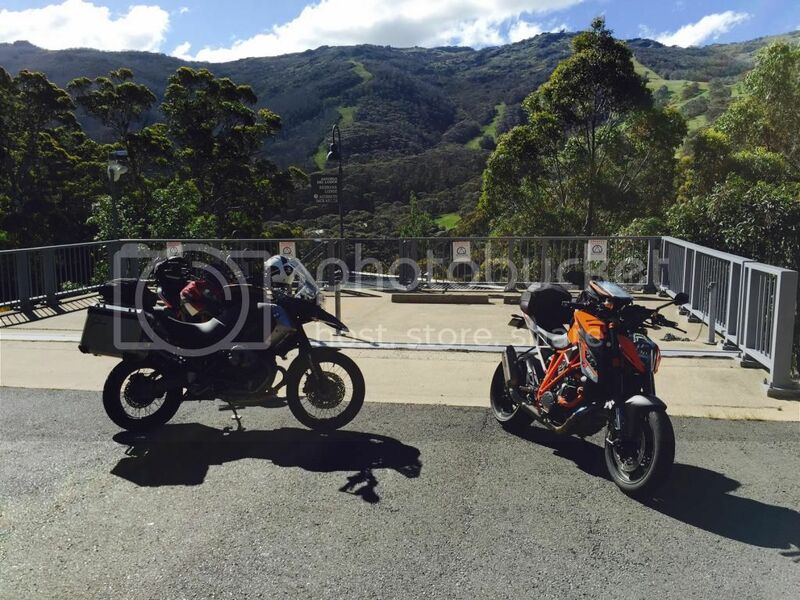 hi mate , looked at the pics from the rear and the can looks bloody close to your back wheel , was it just the angle ?? Yes, it's close - ~5mm. 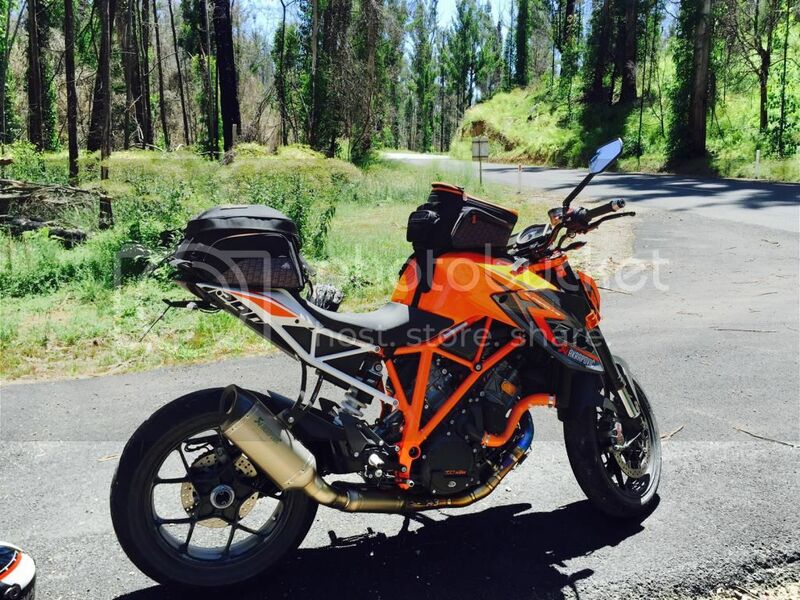 KTM offered a recall on the power parts carbon bracket but I chose to stick with it. 6k miles and no issue so far.